His Holiness Patriarch Kirill of Moscow and All Russia congratulated His Beatitude Pope and Patriarch Theodoros II of Alexandria and All Africa on his Name Day. The text of the message is given below. I cordially greet you with your Name Day. Bowing down before the Holy Martyr Theodore the Tyron, who was faithful to Christ even unto death (cf. 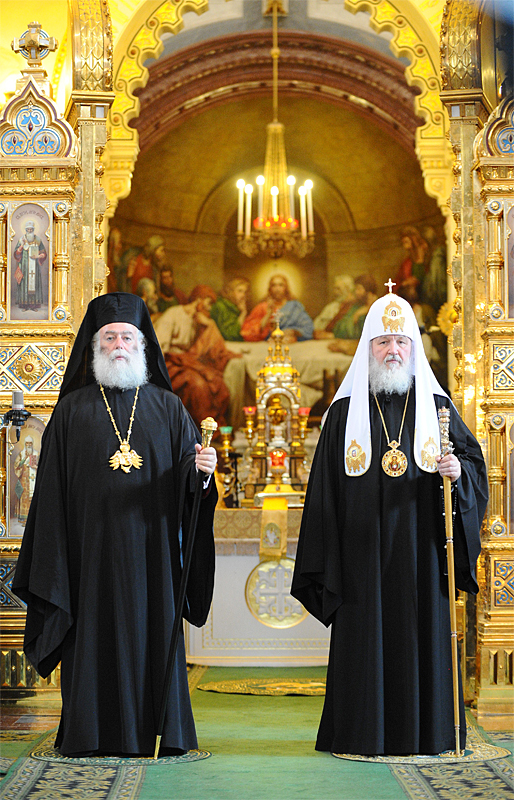 Rev 12:11), the Holy Church glorifies him, proclaiming, “Great are the accomplishments of faith!” Nowadays, thanks to the apostolic zealousness of Your Beatitude, the momentous events occur on the African continent, contributing to the spreading and strengthening of the Orthodox faith there. On this memorable for the whole Church of Alexandria day, I prayerfully wish you spiritual and physical strength, God’s help, and success in your strenuous and important primatial ministry.